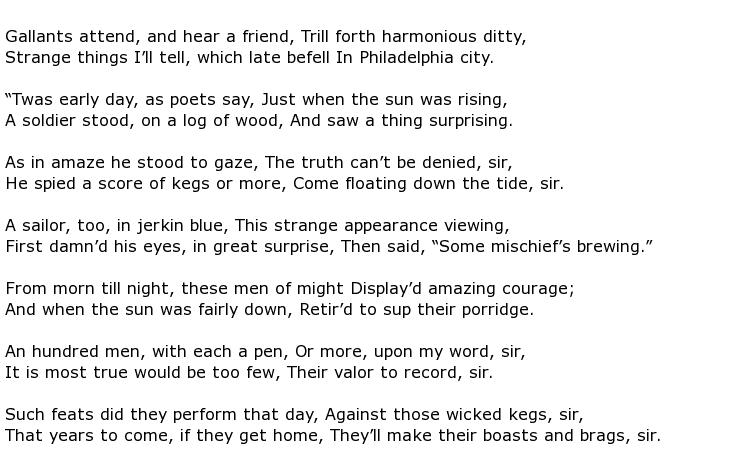 Francis Hopkinson was an 18th century American poet, song writer and politician whose major claim to fame would be that he was the designer of the first American flag following the War of Independence. He was also a high ranking lawyer, sitting as a judge and he also filled a number of positions in the fledgling government. He was born in September 1737 in Philadelphia. He was a bright student at school and college, graduating from Philadelphia College in 1751; then going back to do a Masters’ degree which he received in 1760. He soon found employment as secretary to the Provincial Council of Pennsylvania’s Indian commission. Here he was instrumental in making treaties with a number of tribes. His next appointment was as a customs collector at Salem in New Jersey and then, in 1766, he went to England for fifteen months endeavouring to secure the post of commissioner for customs in North America. He was unsuccessful in this venture but he made a number of useful contacts there in the arts and political fields. On his return to America, Hopkinson met and married his wife Mary and set himself up in business before, once more, taking up government appointments. He relinquished these in 1776 though having been called to the New Jersey bar the previous year. Alongside all of this though were his achievements as a poet and popular song writer. He wrote a great deal glorifying the newly independent United States of America and satirising their old colonial masters. In 1774, for example, he wrote a satire about King George called A Pretty Story and followed this with titles such as The Political Catechism, written three years later. As well as being a writer, Hopkinson was also an accomplished musician and performed on stage with professionals on a number of occasions. He would usually play the harpsichord but he also played the organ at the Christ Church in Philadelphia as well as being responsible for the editing of old hymns and the writing of some new ones. After a distinguished legal career he was commissioned in September 1789, by George Washington, US president, to a newly created post. He became the federal judge of the US District Court for the whole of the Eastern District of Pennsylvania. Unfortunately he did not have long to enjoy this new, elevated status as he died less than two years later. 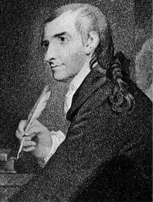 Francis Hopkinson died on the 9th May 1791 at just 53. He suffered a sudden seizure and was interred in the burial ground of Philadelphia’s Christ Church.